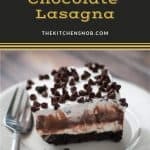 Chocolate lasagna? Seriously, people. What will the Italians think of next? Fine, it’s not Italian. But doesn’t it make you want to eat this while skipping through one of Tuscany’s fields of sunflowers? The Under the Tuscan Sun soundtrack playing while your hair flies behind you in slow motion. 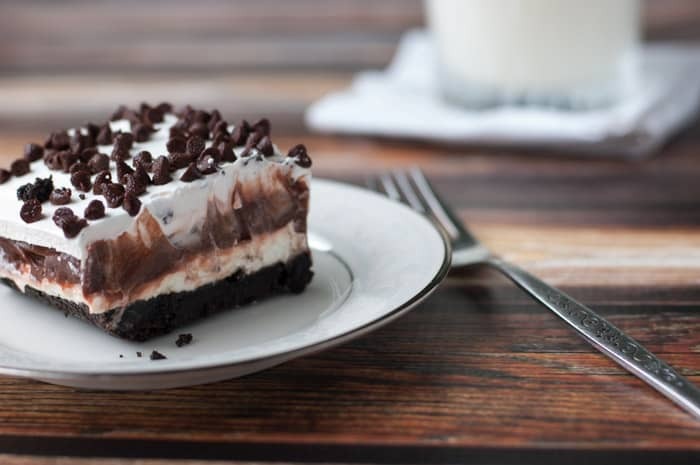 Who can resist creamy layers of chocolate pudding, sweet cream cheese, whip cream, and a crunchy Oreo cookie crust? Not me! 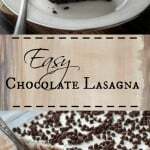 It makes perfect sense to go hog wild and whip up some chocolate lasagna. Wouldn’t you? It’s totally the next logical thing to do. A true addict at work here: a last ditch effort to rebel against dietary restrictions. It’ll be my last dessert. Until I can curb my “problems”. Won’t you join me? 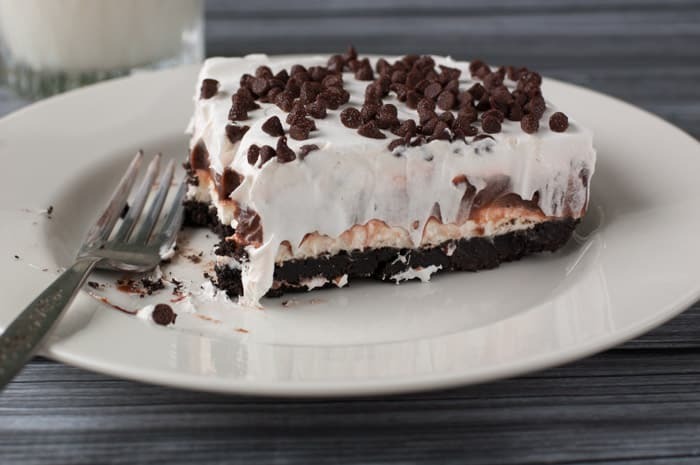 Let’s chocolate lasagna it up! My tankini gives you the middle finger, but my tastebuds give you a big hug!!! Xoxo!! Haha – making desserts like this keeps me out of tankinis. Need the full one piece! I screwed up and bought cook and serve pudding. I cooked the puddi g on the stove and once it thickened, I added it to the dessert and put it in the refrigerator to cool before adding rest of cool whip. Do you think I screwed up the dessert??? It’s fine if you use cooked pudding. Just make sure it cools separately first, before adding it to a layer. If you add hot pudding to a cold layer, it may get kind of runny and the layers won’t look as nice. Probably still pretty tasty! I’ve made this recipe several times. Very good, and a true chocolate lover crowd’s favorite. I’m glad you tried it and liked it! This does look pretty good ! Glad you tried the recipe and liked it! Whoever writes these recipes, your now my favorite person/people. Well thank you, Cassandra! I hope you’ll subscribe to my blog via email so you don’t miss out on my super duper awesome coolness and recipes. I need more cool people like you to make me feel cooler because I usually feel uncool. 😉 Thanks for your comments! Just because I don’t want to screw it up before I start…….do I remove the center filling from the cookies? No you want to put the whole cookies (filling included) in the food processor. Why oreos and not chocolate graham crackers? What is the difference as far as taste? Hi Kat. I’ve don’t think I’ve ever tried chocolate graham crackers. I’m sure they would be delicious in this recipe though and it couldn’t hurt to try them. If I make this, how many people do you think it would serve??? A 9×13 baking dish is supposed to yield 18-24 servings but the slices would be rather small (2×2). I personally like my slices bigger! So I’d say about 12. How many servings will this serve??? Hi Kylie – It depends on the size of your slices. I like mine to be a generous size so I’d say about 12. Happy to hear it, Maggie! My pudding is kind of watery not,really thick. Used a mixer. Will it thicken up in the fridge? It shouldn’t be watery. Is your milk cold enough? Are you sure you’re using “instant” pudding and not the kind you cook? It should thicken within a few minutes of mixing. Try putting it in the fridge for a few minutes before adding to the lasagna and see if that helps. I am overseas where they don’t have instant pudding…I was hoping to make this for company tomorrow, but making it using homeade cooked pudding. What do you think…? I think that will work fine. Just cool the pudding in the fridge first before making the layers. your Chocolate Lasagna recipe is really great. Or at least I’ve been told so, by all who have tried it so far. The comment is rich but very,very good. Thanks, Donna. It is rich! Hope you will try it sometime. I would love to use this recipe but would like to cut it in half. If I do that what size pan do you think I should use? Maybe an 8×8 baking dish? Must Cool Whip and instant pudding be used? Could I use whipped cream and cooked pudding that was cooled? Hi Kathleen! Sure, I don’t see why that wouldn’t work. Let me know if you end up trying it that way and if it works just as well! Oh my goodness this sounds AMAZING!! Thanks, Jennifer! I did sign up for the link party. Thanks for the invite! Thanks for the comment, Natalie. Um hello I love your blog and your drawings! Have made this a number of times for friends and family, ALWAYS a huge hit. Haven’t made it in awhile as I have found out I’m diabetic. Do you happen to know the carb count is ? If not that’s fine,just curious. Again great dessert. Hi, John. I’m sorry I didn’t see your comment until now. I’m glad you like the recipe! I don’t know the carb count. A gazillion? haha. Sounds like a good recipe, but a little less bullsh*t talk between the pics leading to the actual instructions would’ve been nice. I’m sorry you didn’t enjoy my writing, Crissy. If you’re interested in recipes without any stories or writing you might want to look at AllRecipes.com. There are lots of great recipes there without any of the bullsh*t.
Dear Crissy, that frankly was a really rude comment. 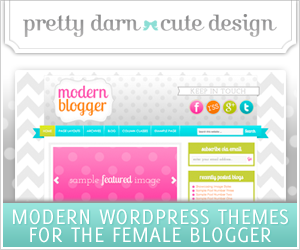 Totally uncool on a blog like this. I am not a cook and I follow the blog not only for the amazing food photography but also the quirky humor. Please don’t leave comments like this on a blog like this. There are plenty other places for mean internet trolling. 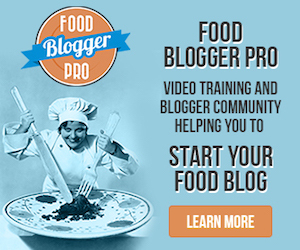 This is a blog, NOT a recipe site. Therefore there will be writing that you can actually read for those of us who like that sort of thing. If you don’t want to read the blog simply skip over it & go straight to the recipe (or go to a recipe site not a blog). No need to get nasty about it. Kudos on the way you responded with kindness & respect. That was very much appreciated. Thanks for sharing your recipes & your wit. I have made this on numerous occasions. Always at the request of family members since the first time I made it. Simply heavenly! This was great. I’ve made it several times. I’ve started drizzling caramel ice cream topping on the top with the chocolate chips. Omg that sounds awesome will have to try that lol…. How far in advance can you make this? Should I store in the freezer until ready to deliver? Thanks! Sorry for the late reply, Chris. We have been moving across country and hadn’t set up our computers yet. You can make it a day ahead and I would store it in the refrigerator, not the freezer (and I say that only because I haven’t tried freezing it). If needed, you could probably make it 2 days ahead but I think the layers wouldn’t look as nice when you cut into it and the bottom layer could start to get soggy. Roget’, You are too full of yourself. I’m sure you enjoy making speeches or lecturing, not the purpse here. She is casually offering us a recipe that she thinks we will enjoy. As her’s, she can name it as she sees fit. 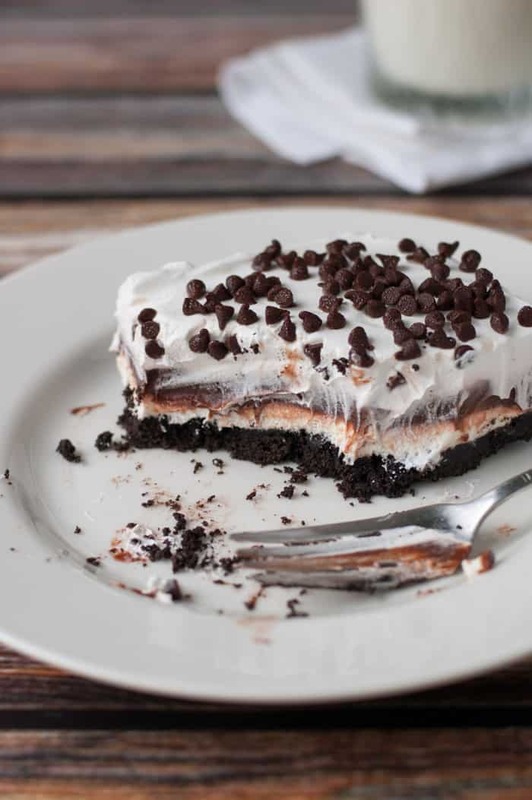 Would this work using a store bought Oreo pie crust? Only asking because I have one on hand & only need to feed 6 people. Hi Lindsey. Absolutely! Obviously, the Oreo layer won’t be as thick but it won’t hurt anything. You can make the whole lasagna in the pie crust pan you have and make thinner layers. 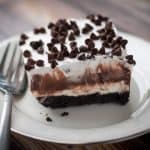 I have done it before, and yes , it works- like warned, just watch how thick you make your layers- you may have left-overs of each layer( oh what a shame) just layer them in a bowl as a pudding dessert for yourself or kids- it tastes great!! Hi I’m really going to try this as a dessert this Thanksgiving. I need to know can heavy whipping cream be used instead of milk? Hi Talicia! I’ve never used heavy whipping cream mixed with instant pudding before. It will probably just be thicker than regular pudding. You could always test a batch, chill it, and then see if it’s too thick. I’m sure it would still taste good! It will just change the texture. Thanks and what abt creamer like Bailey’s instead of milk? I honestly don’t know how the texture would be. With the alcohol and the chemicals in those types of creamers, mixed with the instant pudding, it could turn out a little strange. I don’t want to stifle your creativity though because – who knows – it could turn out great! Thanks but it’s alcohol free lol! Just the Baileys coffee creamer mudslide flavor. Can’t wait to try this recipe! Is it semi sweet chips or milk chocolate chips? My store only had mini semi sweet chocolate chips. Hey Kristi! I used semi-sweet but you could use either. Hope you like it! Great that’s what my store had! Happy Thanksgiving! Hello! Thank you for the gorgeous and what I’m sure is an amazingly tasty recipe!! My only thing is, I want to make a smaller size, like say in a 10-inch pan or even smaller than that. Can I just cut the recipe portions in half and still not compromise taste? Hi Tanya. Yes you can do that. Just make sure you don’t change the milk/instant pudding ratio. Enjoy! What kind are the mini chocolate chips? Semi sweet or milk chocolate? My store only had mini semi sweet chocolate chips. I know this is an older post but I was just wondering, do I need to prepare the instant pudding and then add the 3 1/4 cups of milk? Or just use the mix with the 3 1/4 cups of milk ? Thanks in advance!! Hi Chelsea. You mix the instant pudding powder with the 3 1/4 cups of milk. Happy Thanksgiving! Hi Tina. I’m unfamiliar with Angel Delight, but I looked it up on Google and it looks like a pudding or mousse product. So yes, I think you could substitute with that. And when you say cream, do you mean making your own whipped cream from heavy cream & sugar? If so, yes, you could do that. Hi, Sandy. Thanks for your comment. Glad to hear it froze and defrosted well! Can this be stored in the fridge overnight and then be served the next day? Hi Sammy, yes it can be stored overnight in the refrigerator. 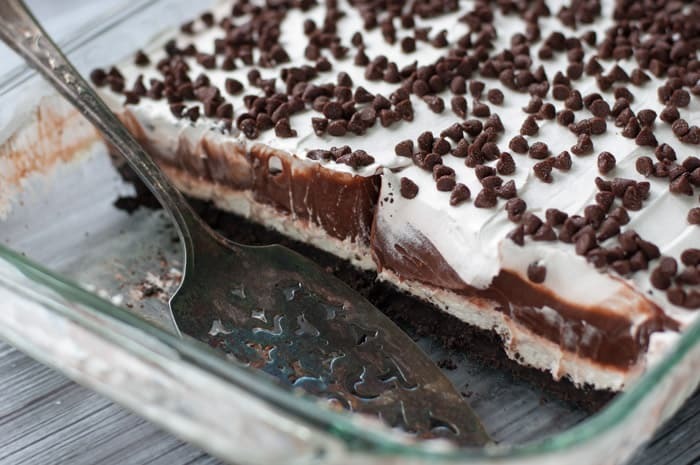 I wonder if I make this tonight if it will be ok to sit in fridge until noon tomorrow ? Yes, it can sit in the fridge overnight. Hi I have made this many times and enjoy it. This year I decided to change things up and am doing one with mint Oreos and Andes mints instead of chocolate chips. I am also doing one with lemon Oreo cookies and lemon pudding. Very excited to see how they turn out tomorrow. Have you tried freezing this for several days and then bringing it out to serve it? Just curious if it freezes well? Hi Christina! No, I’m sorry I haven’t tried freezing it. Maybe others could chime in? I would think it would be ok to freeze, if I had to guess. If you do freeze it, let me know how it turns out! Made this for Easter dessert and it turned out great! My two young boys were able to help out — it was very easy to put together. I would make it again. 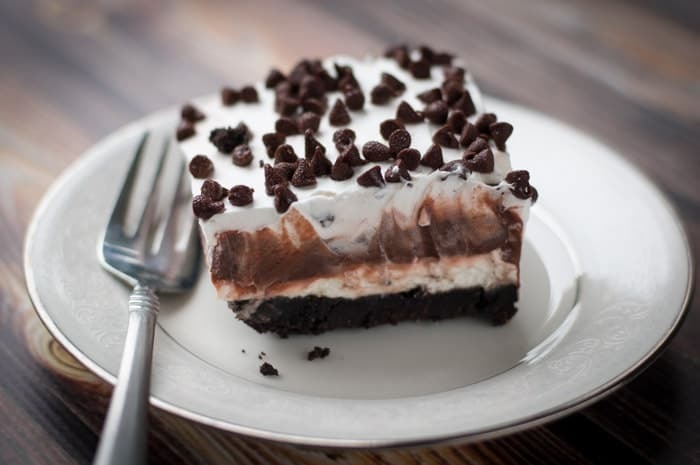 Can this be made a day ahead of time and stored in the freezer? Would you ten thaw on the countertop before serving the next day? Hi Chrissy. I think if you’re making it only 1 day ahead, you can just store it in the fridge. I wouldn’t bother freezing it. This was a hit on my mom’s birthday! Definitely a keeper! Absolutely wonderful! My new get together dessert. Thank you for sharing this great recipe. I took it to a friends house and she said it tasted like a dessert she buys at the store. She was excited to hear she can now make it herself. This dish is the most attractable one. Nice! This is looks amazing!! Can I replace the Cool Whip with homemade thick whip cream? Hi Monika! Absolutely, you can!